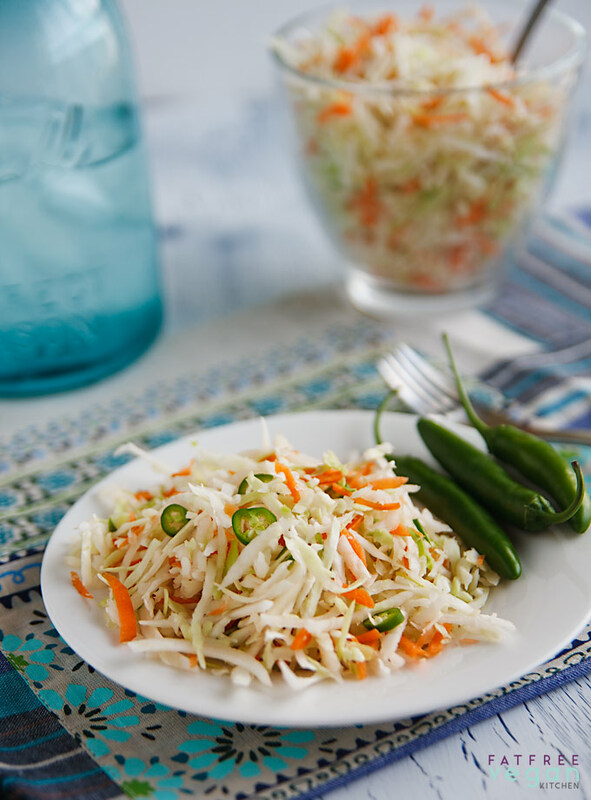 Light yet spicy, this lime and cumin-infused coleslaw is the perfect accompaniment to burritos, tacos, enchiladas or pupusas. I like odd coleslaws, and this one is odd but delicious. Light yet spicy, this lime and cumin-infused salad is the perfect accompaniment to burritos, tacos, enchiladas, or pupusas. In fact, it’s similar to curtido, the cabbage salad that traditionally accompanies pupusas. And it’s easy, ridiculously easy if you use store-bought salsa verde. Plus you can make it as hot or as mild as you like simply by choosing the fieriness of your salsa and chile peppers. I used a very mild salsa verde and then spiced things up by slicing up, seeds and all, my very hot homegrown serrano peppers and throwing them in. I left the hot peppers out of my daughter’s portion, but she still wasn’t a fan. She prefers her coleslaw creamy, so if you’re also a traditionalist, you will probably want to skip this recipe and go straight for my Basic Low-Fat Coleslaw. But if you want to take a break from the traditional, give this odd little coleslaw a try. 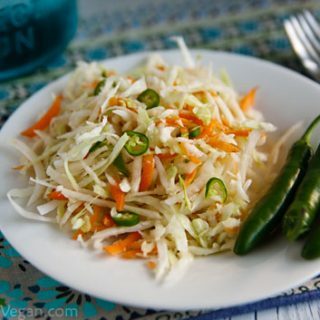 Chile peppers, lime juice, and cumin give this low-fat coleslaw its spicy, Southwestern flavor. One serving is zero points on Weight Watchers Freestyle. I bet it would, too! I used to LOVE pupusas so the idea of having the slaw like that is very appealing! Yum. Susan-I just wanted to thank you for your kind comment in my about me section and for turning me on to the E2L yahoo group. Meanwhile, I am totally gearing up to make a slaw tonight! I love slaws! They are especially great when served with homemade veggie burgers (made with sweet potatoes, beans, lentils, grains, etc). And speaking of veggie burgers, did you know there is a new (I think) Vegan cookbook dedicated entirely to veggie burgers? AWESOME! This really appeals to me–I am a big fan of cole slaw type salad, and have something with cabbage in it almost every day. Most of the time it’s an Asian style dressing with ginger, rice vinegar, apple juice, shallot, tamari, adapted from a PCRM recipe, but I really like cabbage with Mexican dishes. . .I didn’t know the cabbage that comes with it in the restaurant is called curdito. I will click on that and learn more. Your recipe gives a Mexican style dressing more interest than just putting salsa on cabbage, while it also has the virtue of being ridiculously easy! I just bought a tomotillo salsa that would be a good fit with this. And I like how you can adjust the heat so easily. I’ll check on it. Thanks for letting me know. I love that this is spicy and tangy, definitely different from any slaw I’ve seen. I love lighter versions of cole slaw. In the summer, light and fresh is the way to eat. The cabbage are all springing up in my garden, so likely I’ll be making some of this soon! OMG! that looks great… I am a huge fan of cole slaw. It reminds me of the summer time BBQ with my family! In a large bowl, stir together the oranges, reserved syrup, oil, rice vinegar, soy sauce or tamari, and seasoning packet. Add the cabbage, scallions, noodles. Toss gently. Cover with plastic and refrigerate at least 6 hours or overnight. Sprinkle with almonds, toss and serve. (I usually add protein in the form of baked tofu or stir-fry some Morningstar Farms chicken strips, or additional veggies such as chopped water chestnuts, thinly diced red pepper, cucumber, etc.). We can have this salad every week! The hardest part is waiting “overnight” for the flavors to meld and the noodles and cabbage to soften. It could be made in the morning for an evening meal, though. Great recipe, I am Brazilian and I found your blog now and loved it, this salad combines with the dish here in Brazil, rice and beans. Whisper the word “slaw” and all of my children RUN in the opposite direction. *I’d* try it though! I bet it would be good with tempeh marinated in something spicy/southwestern. I love different versions of coleslaw! At this very moment I am eating “Celery, Apple, and Fennel Slaw” — recipe is in this month’s issue of Bon Appetit. Dressing is apple cider vinegar, some oil (which you could probably reduce), lemon juice, fresh tarragon… salt and pepper to taste. The first day I made it I was unimpressed, but I think it just needed some time for the flavors to intensify. Now I love it! Would love to try your Southwestern Slaw too! I just bought a huge head of cabbage at the market. 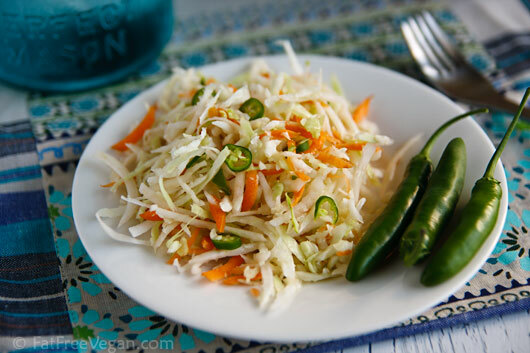 My Southwest inspired coleslaw uses ground coriander and a little bit of cumin, a dash of cayenne, then dressing it with lime juice and mayo, and a bit of chopped cilantro. I like your addition of salsa verde and serranos. Sounds good. I have realized that coleslaw is one of the easiest raw dishes to make & there are a zillion varieties to keep the interest! Haven’t had one with salsa but have done a lot of sesame oil themed ones. Believe it or not, I’ve made three different versions of this since you posted it! The first time I used napa cabbage, red cabbage and carrots with a tomatillo salsa. That was really good. Second time I thawed out a pea, carrot, corn combo I had some left of and put it with red and green cabbage, I think, and a spicy black bean salsa. Also good, but a little runny because of the frozen veggies. This time I really got wierd, but I think I like it the best–it’s sort of a fusion of coleslow and sweet potato salad. One sweet potato, cubed and steamed until just tender, a little bit of thawed frozen corn, red cabbage, green onions–and I used the black bean salsa, which is spicy (homemade, from my neighbor). At the last minute I threw in about seven rainier cherries, pitted and chopped. And I roasted the cumin and added a little more. Didn’t have any hot peppers any of these times, but of course they would add to it, for sure. And since I am sensitive to citrus these days, used red wine vinegar instead. Anyway, kind of a crazy kitchen sink use everything on hand thing, but it tastes really good. 🙂 Thanks for the great and easy template to play with. I think this one I just made will taste really good in a tortilla, or on top of a bed of fresh spinach. Tonight I just ate it as a side with some pasta. I like it! I tried it, so easy to prepare it and I like it……..the taste was unique in a good way. I like hot chilli peppers with meatballs, with roasted chicken and even with vanilla ice-cream……….I’m kind of a freak. I know. I made this slaw to go with purchased vegan “pulled pork” (obviously, it was processed; I know, that’s bad, but I couldn’t find jack fruit in my area to make it from scratch and I sure had a mean hankering for some bbq). Anyway, I took ridiculously easy to another level and made it with the pre-shredded broccoli slaw mix sold in the package in the produce department. The slaw was good, very good (I loved the kick from the peppers). I wish I could say the same for the “pulled pork” (the texture was great; the sauce, not so much).